On the 9th Day of Christmas … We’re going to share recipes for easy holiday treats! I have two cheese ball recipes that you and your guests will love. Using a fork, smash & stir all ingredients until they are mixed well. (Optional: You can chop pecans, cashews or almonds and either mix with other ingredients or roll chilled ball in mixture to create a light coating.) Place in decorative bowl or plate and surround with Townhouse, Wheat Thins, or Club crackers. Combine the butter and cream cheese, either with a fork or hand mixer, until smooth. Blend in confectioner sugar, brown sugar, and vanilla. Next, mix chocolate chips and chopped nuts into the mixture, starting with a small amount and adding more gradually to desired strength. (Optional chopped cranberries can be added at this time as well) Chill for 2 hours, shape into a ball, then roll in remaining chocolate chips and nuts. Place in decorative bowl or plate and serve with graham crackers or chocolate wafers. I hope you and your guests enjoy these yummy snacks. For today’s contest, tell us what your favorite holiday treat is. Share a recipe if you’d like. Tell your friends to stop by and join in. Everyone who comments will be entered into today’s drawing for a $5 Starbucks gift card. Yesterday’s winner is Crystal B. I’ve already sent you a link to your gift – the eBook copy of By Love’s Honor Bound. Congratulations! On the 8th Day of Christmas … I have another title perfect for the holiday season. Colonel Nathaniel Walker has been ravaged by the Civil War nearly as much as his country has. Now he seeks the sanctuary of home, hoping to find solace from the dreams that haunt him most nights. Instead, he finds an orphanage for war orphans has sprung up next door. Now, his guilt has faces – fourteen of them. And the woman who cares for them. Melanie Treymont exhibits more courage under fire than any soldier he’s ever seen. Is she the one who can help him rebuild his life and finally put his demons to rest? These two tortured souls unite for the children, working to build a life for them as well as themselves. They start by Building a Christmas. 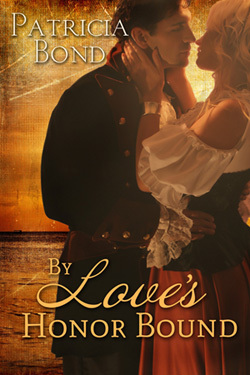 Patricia Bond is also the author of By Love’s Honor Bound, exclusive on Amazon. For today’s drawing, I’m giving away a copy of By Love’s Honor Bound. Simply go to her website and tell us one fact about Patricia. Anything you find interesting about her. I’ll post the winner tomorrow.